Go, Go, Go Astro Boy! For those of you who survived last weekend's 3-day, 100 episode marathon of Naruto on Cartoon Network, treat yourself to the final days of "Tezuka: The Marvel of Manga" at San Francisco's Asian Art Museum. Considered by many to be the father of much of the modern-day anime and manga, Tezuka Osamu's Astro Boy paved the way for Japan's entry into the United States market. Astro Boy was one of Tezuka's greatest creations, and he is on display alongside many of his other favorites, including "Kimba the White Lion". This exhibition is a wonderful tribute to Tezuka Osamu (1928-1989) -- a revered artistic master and pioneer in the world of manga and its offspring anime. In his lifetime, Tezuka created more than 700 titles and 150,000 pages of artwork. His legacy can be seen in the manga and anime being created today, and in this exhibition, a closer look at his work, his themes, and the man himself is given. The Asian Art Museum is the only North American venue to host this special exhibition which began June 2nd, and ends September 9th. Organized by Australia's National Gallery of Victoria (NGV) in association with Tezuka Productions, the exhibition has already shown in two venues in Australia, but this is its premiere in the United States. In addition to the artwork on display, the exhibition will also offer a wide array of public programs, including film screenings, lectures, demonstrations, and a manga lounge where you can try to create manga yourself. Osamu Tezuka was born in Osaka at a time when Japan was facing its greatest changes and challenges as a nation. Western culture and art, once rare, were now readily available in Japanese society. Young Tezuka was greatly influenced by the early animated films of Walt Disney, and was especially fascinated by the artistry of Disney’s animated masterpieces, Snow White and Bambi. Before embarking on a career as a manga artist, Tezuka studied medicine, and he later earned his credentials as a doctor. His medical thriller, "Black Jack" is an excellent example of Tezuka taking his interest in the science and ethics of medicine and translating it into compelling storytelling. While in college, Tezuka began cartooning and created New Treasure Island (Shintakarajima), which sold over 400,000 copies -- a staggering figure for a comic book at the time. His artwork for New Treasure Island is admired for its cinematic quality -- events and emotions unfold as if the reader were watching a film. Throughout his creative career, Tezuka pioneered the East-meets-West storytelling style that greatly influenced the development of modern manga. Later, Tezuka formed his own animation studio and his innovations in this industry influenced the evolution of a homegrown anime/animation industry that flourishes today. 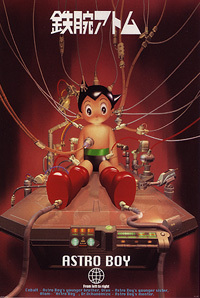 Tezuka's Astro Boy, told the tale of a scientist whose young son is killed in a car crash. Tormented by madness and racked with guilt, the scientist re-makes the boy as a virtually indestructible robot, and Astro Boy is born. 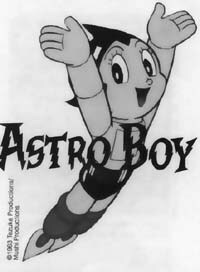 Ultimately rejected by his "father" for being unable to grow up like other children, Astro Boy struggles with his quest to be more than just a robot and his "Pinocchio-like" desire to be a human boy. It is this journey that makes Astro Boy more human than those he tries to save, and the genius of Tezuka that brings those ironies to life. Tezuka mentored and influenced many contemporary manga artists. His decision to draw characters with large eyes to enhance their expressive, emotional qualities has been passed down to many generations of artists who have followed in his footsteps. Today, the Asahi Shimbun, a major Japanese newspaper, honors excellence in contemporary manga with the Osamu Tezuka Cultural Prize. Dr. Tezuka was not only innovative, he was extremely prolific. In his 40+ years as a cartoonist and animator, Tezuka created 700 stories and 17,000 pages of comic book art, and numerous popular and award-winning animated TV series and award-winning short films and feature-length movies. Another remarkable aspect of Tezuka's career is his consistent ability to draw compelling, sensitive stories in a variety of genres, for almost all ages of readers. For example, Astro Boy and Kimba the White Lion were meant for young boys. Princess Knight was created for Nakayoshi, a magazine for girls. With their complex, nuanced storylines and dynamic compositions, works such as Phoenix and Buddha were clearly meant for older audiences. And yet all of these works, no matter how different in tone, style and intended audience, still retain Tezuka’s style of drawing. Dr. Tezuka died at the age of 60 in 1989, drawing and writing until the end. His lifework was honored by the opening of the Osamu Tezuka Museum of Cartoon Art in Takarazuka, Japan. Today, more and more of Tezuka’s manga is being translated into English, French, German and is readily available to comics connoisseurs worldwide. "Friends will cheer you... You're our hero... As you go, go, GO Astro Boy!"